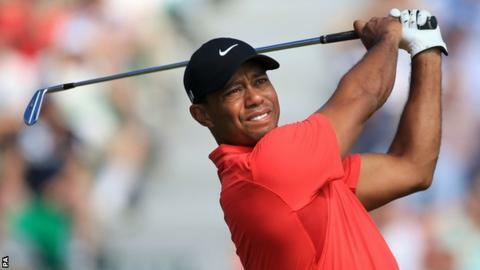 Former world number one Tiger Woods says he can still compete at golf's top level, despite admitting he can no longer drive as far as many players. The 38-year-old returns to competition at the World Challenge in Florida on Thursday, his first event since August following back problems. "Father time is undefeated. We all lose some things we could do," he said. "I can't blow it out there with some younger guys any more. But there are other ways. You can win at a late age." Woods plays alongside Australian Jason Day in the opening round at his home course, the Isleworth Golf and Country Club in Windermere, Florida. He said: "You don't have to physically dominate in golf. You just have to turn up and play. I am not quite 40 yet. I still have some time." Woods won the most recent of his 14 majors in 2008 at the age of 32 and is still waiting to gain further ground on the record of 18 held by Jack Nicklaus. After losing his number one ranking during a break from golf to resolve personal issues, he overcame injuries to regain the top spot in March 2013 and won five times last year, earning him the PGA Tour's Player of the Year for a record 11th time. This year his injury troubles resurfaced and he required surgery. But he said of his back: "It feels great. I have done the proper rehab. I just need to hit more balls. I don't have the sharp pains any more. "I still have aches and pains but am past the rehab level, now I am into strength and development. I have been playing a ton of soccer with the kids in the back yard." Now ranked 24, Woods says he and new swing analyst Chris Como have looked at footage from his amateur career to learn how he generated so much speed with his slender frame. "It was pretty interesting trying to find a VHS recorder," Woods joked. "I have a lot of tape like that." Eye on the Tiger: Has Woods still got it? Read more on Tiger Woods return: Has 14-time major winner still got it?